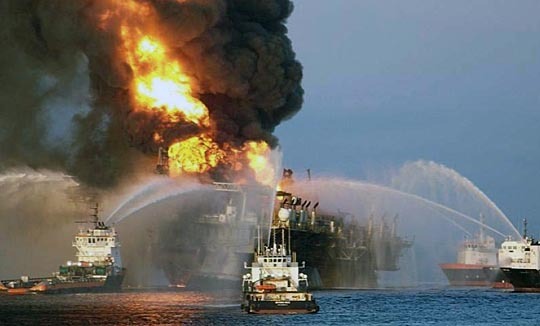 The last two days has seen what appears to be some progress in the capping of the Gulf oil leaks. BP is currently lowering the 100 ton dome that is intended to cap and capture oil from the middle leak of the three. The open end of the riser was also closed on May 4th by fitting a valve to the end of the pipe and closing it. There are however, two different results from the different methods of treating the problem. Plan for sealing the second leak in the riser. The oil is flowing out of the well, through the Blow-Out Preventer stack (BOP) which is mounted on the sea bed and into the pipe that would have initially carried the oil to the surface and the drilling rig. When the blow-out occurred, natural gas flowed up that riser, and was ignited as it left the pipe, on the platform. To help with understanding I am going to include a couple of items that I have been sent to try and give a better picture of the overall situation as well as where we are today. UPDATE: There is a new website that is now co-ordinating information for the Unified Command, and, among other things they have posted this picture from late last night. Cap for the second leak being lowered below the surface. The site also has pictures from one of the initial test burns. Firstly, to help with some of the discussion on the structure of the rig there are a couple of pictures, first of a sister rig while aboard a ship, so that you can see the pontoons, and then with the Deepwater Horizon in the water. 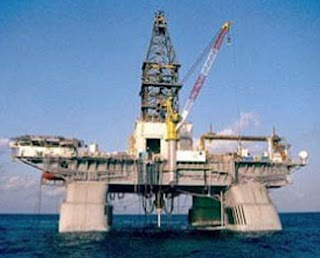 When the rig is in the water the lower parts are submerged, and only the legs and platform are above the water. 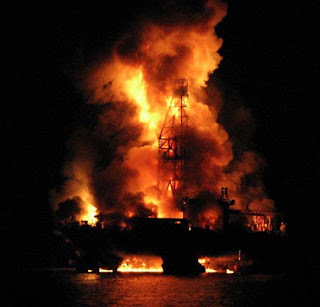 When the fire began it was fueled by the initial flow of oil and gas that came up the riser from the wellhead on the sea bed, through the rig floor and engulfed the drilling mast. As I noted earlier, there is some indication that the ignition came after the power to the rig was cut, and then the emergency generators kicked in. However, initially, as can be seen from the form of the fire, the fuel was coming up the pipe from the sea bed. 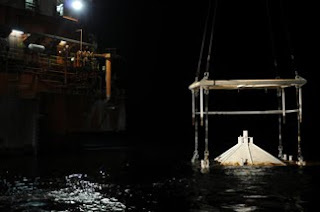 The rig, as you know, sank shortly thereafter. I am going to add some illustrations to help those of us who don’t do this every day understand some of the terms and conditions that are referred to either in discussion or in the media. (Thanks to Roland V). The first of these is the casing shoe, which is the piece of pipe that is threaded onto the bottom of the casing to help guide it into place. The other area that I want to address is where the well starts on the sea bed. Remember that when we are drilling a well mud is used to cool the bit, clear the cuttings and stabilize the walls of the well. Well this normally flows up around the outside of the drill pipe, but when it gets to the sea bed it is captured between the casing that was initially set into the sea bed to stop if falling into the hole, and the high pressure drilling pipes. Thus when one looks at the area around the wellhead there are actually several pipes going into the ground. The first of these is a relatively low pressure outer casing, that holds the surrounding ground in place as the well penetrates through it and down towards the rock with the oil in it. 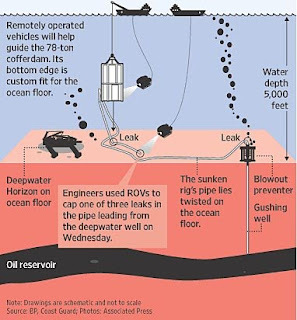 Within that there is a second, higher pressure tubing that will carry the fluids down to drill the well, which may be an additional 20,000 ft deeper (at 1 psi per foot rock pressure perhaps) and which must contain the oil and gas flow that will then come from that site. As an example, you can see, from this view of a Cameron assembly, through a window in the lower pressure casing to the higher pressure fittings inside. 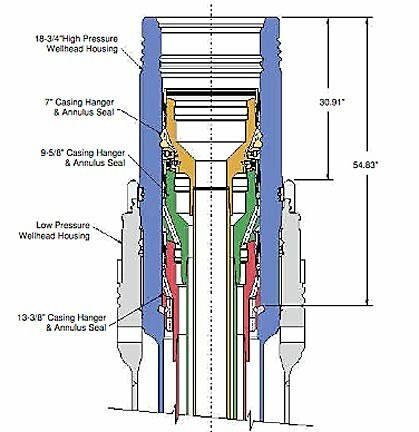 Notice that there have to be seals between the high pressure drilling/production line and the lower pressure confinement casing/housing. 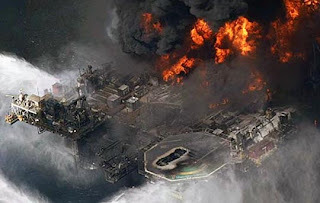 Should high pressure fluid get into the space behind the outer casing, then it could be sufficient to crack it, and there is not always monitoring equipment in place, subsea that can check to see that this has not occurred. 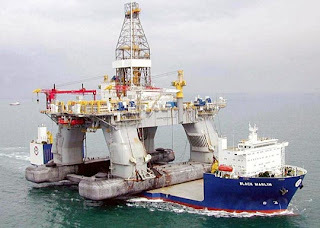 There is also a passage so that the drilling fluid which flows down the central bore to the bit, can also has to come back out of the hole, and be confined as it is carried out of the well and back up to the rig where it is cleaned of cuttings and re-circulated. It should be born in mind that the BOP sits on this assembly, and that the lowest leak is about 50 ft above the BOP, so that there are apparently no leaks in this section of the structure, as far as I can determine, at this time. 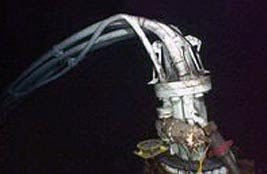 The current condition of the riser above the BOP has been badly distorted by the collapse of the pipe to the sea floor. And the difficulty in fitting a cap over the assembly can be estimated from the condition of that area. 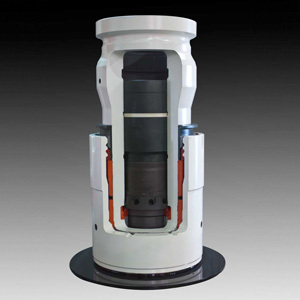 When the production casing is floated into the well the high-pressure drill pipe is removed, and the production casing floated into the well. 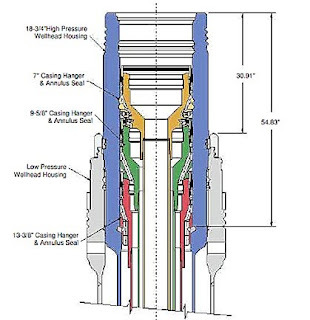 It will have the assembly shown in the earlier picture, and will be sealed at the joints along its length so that the cement flows down to the shoe, and then fills the bottom of the well, and then flows back through the gap between the production casing and the rock walls, displacing the mud and filling that gap. The intent is to ensure that all the oil and gas will be forced to flow through access holes that will later be inserted through the production casing and the cement liner, using shaped charges. There are a couple of considerations when the wells get this deep, the first being that the rock is very hot at that depth, and so the cement chemistry has to be carefully controlled to ensure that it stays liquid long enough to totally fill the gap that it is being injected into. The second area of concern lies with the pressure at which the cement is injected. Because the rock is under a lot of pressure initially, and can also be quite weak, the cement must be injected at a pressure that will be enough to drive it up along the gap, but not at too high a pressure. If the pressure is too high, then the rock around the well can be cracked. In that case some of the cement can be pumped into the crack, and the full volume fill may not be achieved, and the circulation path for the cement back to the well head may be lost. The shape of the wiper plugs are slightly different to those that I showed in the earlier post. The plugs are activated by first causing the plug releasing ball to be locked into the plug, sealing the flow passage, and then the pressure of the cement/driving mud will push the plug down the casing, wiping the walls as it goes. 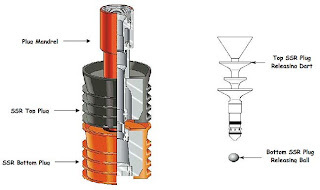 When the plug gets to the bottom of the well, the ball in the bottom plug is pushed out, and this allows the cement to flow into the gap (annulus) around the casing. Some of this additional explanation, as I have said, is more to help fill out the background to the ongoing story. At the present the large cap is being lowered to the second leak, and we may not know if this works until Monday. It has one advantage over the first step in the process. When the initial seal was put over the end of the riser, it closed the open end of the pipe. However the riser was split in two additional places. It is the intermediate leak that is the current target. When the pipe was capped the pressure driving the oil up out of the ground did not change. As a result, since the other two leaks are still open, all the oil that was going out of the three holes is now flowing out of two. However when the intermediate cap is placed over the riser it will capture some of the oil, and depending on how the pressure in that cap is controlled, by drawing the oil to the surface, it might be possible not only to capture that portion of the spill, but also to reduce the pressure at that point a little, relative to the third split, so that the flow from it is also reduced a little. It has been suggested that this idea is relatively novel, and the patent on the idea is relatively recent about 2000) though it appears to have been quite successful at shallower depths. 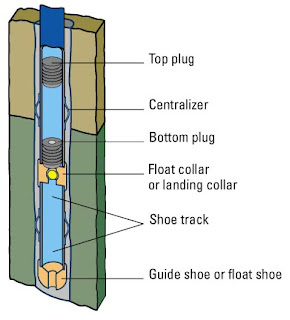 The technique is a variation on the Riserless Mud Recovery System (RMR) that has been successful in a number of earlier wells, though at shallower depths. We will wait to see how it works this time, though I can't at the moment, see why it should not. You're welcome, and any updates you might want to share would be appreciated. I would like to thank you Dr. Summers for your scientific, informative and thoughtful posts on the ongoing effort to cap BP's Macondo well. It has been difficult to find any useful information in the mainstream news media. Your posts, and the coverage provided by UpstreamOnline.com, are the only in-depth coverage I've found that is worth reading. Please keep your posts flowing!